There is a well-known line from the movie, Field of Dreams, that goes, “If you build it, they will come.” While the person who said this line was referring to a baseball field, and not a church, it still fits the situation at St. John’s Church, in the Parish of Richmond, NB, quite well. As you may recall, the parish voted to build a new church and parish centre. The design is simple yet practical, it provides for congregational worship, three Sunday school classrooms, a nursery, modern washroom facilities, kitchen and storage space. The one and only step in the entire building is the one up into the sancturay. It is warm, comfortable, useful for many kinds of functions and accessible by all. 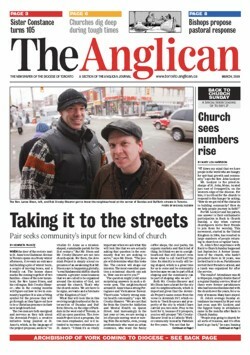 Pair seeks community’s input for new kind of church…an article about Lance Dixon and Rob Crosby-Shearer’s fresh expression of church in Toronto. 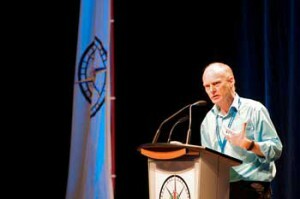 Click here to read the full article from the Diocese of Toronto’s “The Anglican”, by Henrieta Paukov. 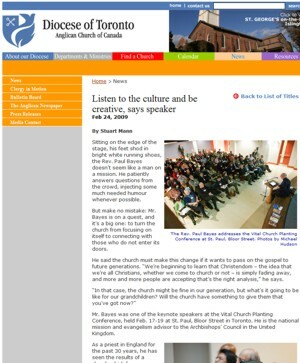 Click here to read the full article on the Diocese of Toronto web site, by Stuart Mann. Books & Culture reviews Susan Strempek Shea’s journey through America’s churches. Helpful to anyone wanting a fresh reminder of how Sunday morning worship is experienced by a visitor. Click here to read more.